I knew it was a good sign when my mother-in-law, Emily, started rattling off the ingredients for her go-to berry cobbler over the phone, then interrupted herself to say, This index card is so stained and old, who knows where on earth I got it from? Those of you who have read my book know about Emily’s Index Card Cache (a.k.a The Recipe Starter Kit) we inherited from her a few months after we were married. And those of you who have made her Meatloaf know that those index cards rarely disappoint. 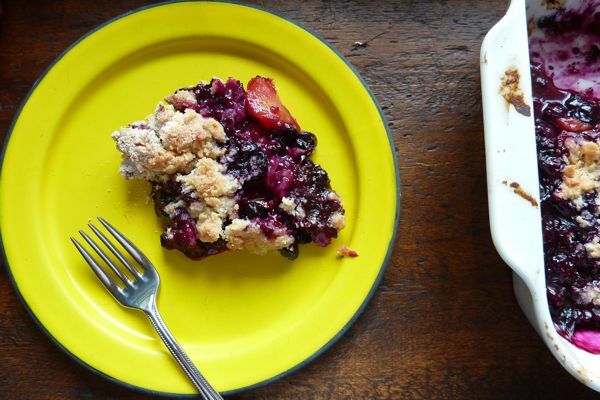 This cobbler — a flexible, non-fussy, absolutely-screams-summer kind of dessert — follows suit. My favorite thing about the recipe (besides the crunchy crumbling topping that somehow weaves all the way into the filling) is that it doesn’t involve getting butter to the right temperature, then smushing it into the sugar and flour, which I always find to be a somewhat perilous (and messy) proposition. You simply drizzle the melted butter on top at the end, which means the whole thing comes together fast and with minimal fuss. My other favorite thing about it? The original recipe called for that butter to be margarine. I assembled this particular cobbler (made with peaches and blueberries) in about 10 minutes, shoved it into the oven, drove across town for a playdate pick-up, and was back in time to pull out the bubbly goodness just about a half hour later. 5-6 cups fruit (Any combo: peeled, sliced peaches or nectarines, blackberries, raspberries, blueberries; for this one I used 8 medium peaches, peeled and sliced, and 1 1/2 pints blueberries) enough to mostly fill a 13-by-nine inch baking dish. Place fruit in a 13-by-9-inch baking dish. Sprinkle on lemon juice and toss. In a medium mixing bowl, whisk together dry ingredients. Add egg, tossing with fork until mixture is crumbly. (It should not be mushy.) Sprinkle flour-egg mixture over fruit then drizzle as evenly as possible with melted butter. Bake at 375°F for 35-40 minutes. Serve warm with vanilla ice cream. Emily’s Index Cards. See page 15 of Dinner: A Love Story. That looks delicious. 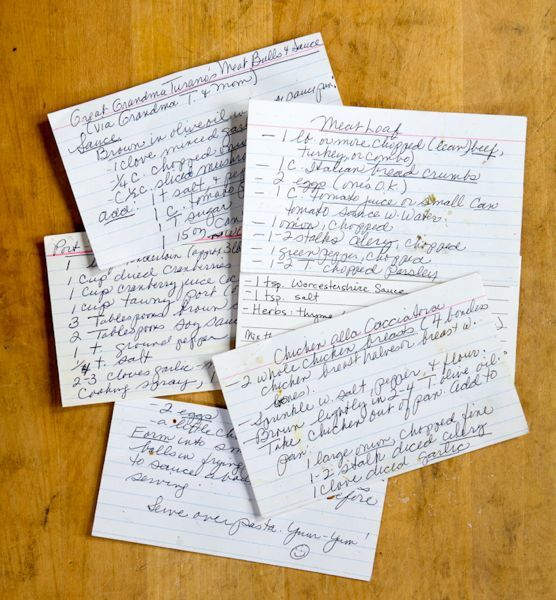 This makes me think of my mother-in-laws huge box of index card recipes. She died this past september and I have an overwhelming urge to drive over to her house and sequester them. My grandmother came to stay with me when my youngest baby was born (almost seven years ago!) and she hand wrote on a scrap of paper her recipe for scratch biscuits. I love it so much I laminated it. Wow. This looks amazing. I haven’t tried any of your mother in law’s recipes but I think this will be our first. I have a giant box of peaches sitting on my counter just waiting to be used! I have peaches AND blueberries (loving the summer fruit) and this looks like a perfect way to use them. Since it’s a recipe your mother-in-law uses so often (as demonstrated by her description of the index card) I know it will taste as good as it looks in your picture. This looks SO similar to the Southern Living cobbler recipe that I use (http://www.myrecipes.com/recipe/easy-blackberry-cobbler-10000001816143/). And if it tastes anything like the one I make, then it’s definitely a winner 🙂 Nothing beats homemade cobbler with ice cream in the summer. Ah cobblers. My husband will be very happy, his favorite dessert! I’m a big fan of the butter drizzle, really makes life so much easier!! Wait, if one pint of blueberries is about 2 cups, how is it that the total amount of fruit is 3 cups if you used 1.5 pints blueberries plus eight peaches? I’m guessing you meant 6 cups of fruit total? Thank you! I just made it. And I found three cups of fruit to be more than enough for the 13×9 pan. I wound up only using peaches (because I had a TON of them) and used nine (well, maybe about 8 1/2 because I ate a few slices on the way). wouldn’t this be considered a crisp or crumble, rather than a cobbler (which I always thought was more of a biscuit topping)? crisp, crumble, cobbler, buckle, slump, brown betty, etc. so many possibilities! I love the names of all these summer fruit bottomed desserts. That cobbler looks to good and easy to resist. I cant stop reading your book! its on my nightstand and every morning i read a few pages and it consistently makes me late to work where i think about food all day!! Yum!! We’ve been having family dinner at my mom’s every Monday lately (mom, my stepdad, and all 6 of us siblings and step-siblings plus spouses and kids!) and each of us kids is responsible for taking a turn bringing dessert each week. I’m so making this next time!! I made this tonight and oh my Lord was it good!!! And so, so easy to make!! This one is sure to get cycled into my regular dessert rotation. Thank you so much!!! there ain’t nuttin like a good ol fashioned cobbler, yours looks fabulous! We love a good cobbler. I can’t wait to make this one next week. The peaches from the Cleveland West Side Market have been very tasty. They will be perfect. Man, this was fantastic. I was skeptical since it seemed too simple (no sugar on the fruit?). Next time (which may well be tonight, with peaches) I’ll skip the sifting and reduce the flour by 2T and see how that works – sifting is kind of a page-turner for me! Angela – I can’t believe I didn’t edit out the sifting. It’s a total page-turner for me, and as I mentioned in the book, it was a life-changing moment when I read an article by Shirley Corriher saying that whisking flour was just as effective as sifting. So by all means skip the sifting! I just tweaked the recipe to reflect this. Thanks!! Made this for guests on a low key barbeque Saturday night and was a rave hit. SO easy and perfect to pop in when the burgers and hot dogs went on the grill. It was ready and delicious with vanilla ice cream when we had finished eating. So it’s officially confirmed — sifting is for suckas!! I made it again last night, no sifting, and it was just as good. I did reduce the flour by 2T but I doubt that’s even necessary. And I didn’t offer the leftovers to our storm refugee/house guest for breakfast this morning becasue I am a bad person and want to eat it myself. Piling on to say I made this for a party last night, and the kids were literally picking the last crumbs out of the pan with their fingers, after the adults had already snuck seconds. I too was a bit skeptical, tempted to do stuff like throw in some cornstarch and sugar with the fruit, but I’m so glad I followed the recipe to the letter. Just made this last night, and it was fabulous! My husband looked at me while eating it, and said “This is delicious!” He rarely gives compliments like this – thanks! I’m loving your book, and you inspired me to plan the week’s menu. For the first time in probably a year… Thank you! Made this with a bunch of frozen blackberries from last year’s harvest (thawed slightly in the microwave first) and it came out GREAT. I think my pan was a tiny bit large, because the fruit and topping were a bit thin, but that’s easily remedied. I too was skeptical (an egg? drizzle the butter? no cornstarch?) but it turned out wonderfully and it was so easy. I can’t wait to try it with other fruit combinations! Incredible! Just made this in a tart pan for a cookout later, but it also made enough filling and topping to fill a ramekin. My daughter and I just gobbled it up. This is going to be tough to share later. Also, I finally got your book and I am speeding through it. Love it! I’ve made this 3 times! Sometimes I even double the crumble topping 🙂 So good! Just made this recipe tonight and it was awesome! Thanks so much!!! And I love your book. Your cooking style is just perfect; can’t wait to make even more recipes from this website and your book 🙂 thank you again! This looks/sounds divine! I made a similar crisp this morning for our weekend trip. I used 3 peaches, a bag of frozen blueberries, 2 cups of rhubarb, and two apples because that’s what I had at hand. I hope it’s good!! Is all stained with ingredients! Love that. I have a huge bowl of apricots on my counter that are now screaming ‘cobbler!’ Thanks for the tip!! Awesome cobbler! I did not have an egg and it was still good! Thanks a lot! So perfect! I made this today with my son for Father’s Day! We put in blueberries, peaches, rhubarb and cherries. Hope Grampa likes it! Added a 1/2c cornmeal to the crumb topping. Used peaches and blueberries…delicious! Made this tonight with pear, apple, cranberry and a little crystallized ginger in the crumble. Just as good for fall as it was with berries in the summer! I’m late to this cobbler party, but I had to comment anyway because this is BY FAR the BEST cobbler I’ve ever made. The recipe absolutely lived up to the hype! Used 7 red haven peaches plus frozen blueberries from last year’s farmer’s market haul. Followed the recipe exactly except for doubling the topping (my favorite part to any cobbler), and it turned out amazing. Thank you for yet another fantastic, go-to recipe!